Just as athletes stretch their muscles before every game and musicians play scales to keep their technique in tune, mathematical thinkers and problem solvers can benefit from daily warm-up exercises. Jessica Shumway has developed a series of routines designed to help young students internalize and deepen their facility with numbers. The daily use of these quick five-, ten-, or fifteen-minute experiences at the beginning of math class will help build students' number sense. Students with strong number sense understand numbers, ways to represent numbers, relationships among numbers, and number systems. They make reasonable estimates, compute fluently, use reasoning strategies (e.g., relate operations, such as addition and subtraction, to each other), and use visual models based on their number sense to solve problems. Students who never develop strong number sense will struggle with nearly all mathematical strands, from measurement and geometry to data and equations. In Number Sense Routines, Jessica shows that number sense can be taught to all students. 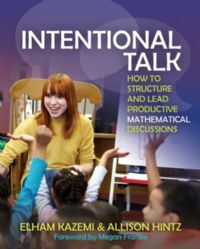 Dozens of classroom examples -- including conversations among students engaging in number sense routines -- illustrate how the routines work, how children's number sense develops, and how to implement responsive routines. Additionally, teachers will gain a deeper understanding of the underlying math -- the big ideas, skills, and strategies children learn as they develop numerical literacy. Jessica Shumway has worked as a second-, third-, and fourth-grade classroom teacher and as a mathematics coach for teachers of Pre-K through fifth grade in Texas and Virginia. She is currently an assistant professor of mathematics education at Utah State University. During Jessica’s undergraduate years at George Washington University, she volunteered at an elementary school and a high school in Washington, DC. She tutored students in math and English and found that she really looked forward to her time in the schools and with the students. "The more I was in the schools and the more I inquired about teaching, I realized that I wanted to be a part of such an important profession." Jessica says that she became a teacher because teaching is a meaningful and challenging profession. "It is true hands-on, active work in which there is never a dull moment. As a teacher, you really get to know and understand a group of young people. You get to watch them grow and reach their goals."